I got up at 4:30am and headed down to the South Bank to take this image at first light. The forecast was for clear skies and the slack water of high tide was due early morning, so it was a suitable day for this photograph which I had planned for some time. It’s a view seen so often before, but with the still water and interesting light the effect can be marvellous – the reflections on the surface, and the soft, warm dawn light make it very atmospheric and even quite mesmeric. This image consists of 3 exposures stitched together digitally, taken with a tilt/shift lens in order to increase the breadth of the view without changing the perspective. I used a ND filter to further smooth the water and then tweaked the image in Colour Efex Pro software to boost the tones a little. 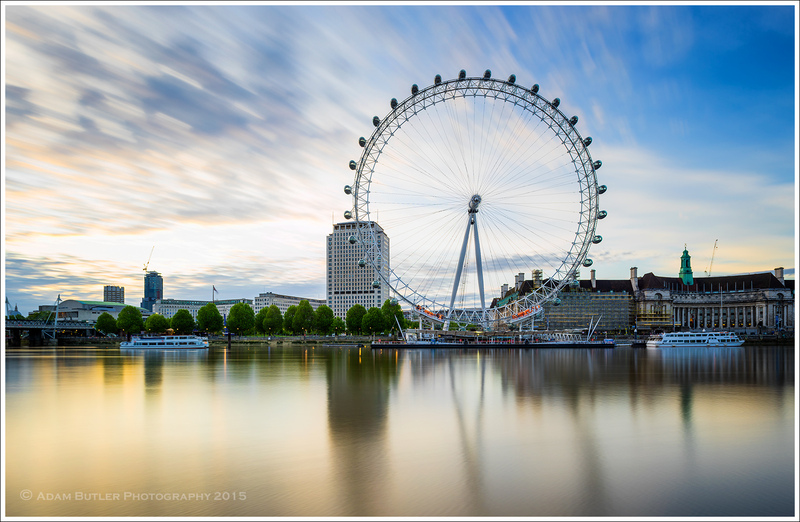 London Eye at Dawn is available to purchase as a limited edition, fine art print. Please enquire if you’d like it in any specific, custom size – it can be printed in any size up to 3m wide. The prices at right are for an unframed archival pigment giclée print on heavyweight Hahnemülhe 100% cotton photo rag paper. These are all either personally made by, or printed under the direct supervision of Adam Butler, and come with a lifetime guarantee. This image is also available in as a reverse perspex print, or traditional print mounted onto aluminium or other materials, see framing options for more information.